The Skinny: Was this necessary? Interesting prequel to the classic Hong Kong films arrives without John Woo or any real reason for happening. Tsui Hark brings us this prequel to A Better Tomorrow, which is noticeably without original director John Woo. Tsui had a falling out with Woo, so Tsui himself directs Chow Yun-Fat as his Mark character from Better Tomorrow 1. 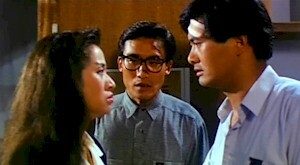 Mark heads to Saigon 1974 and hooks up with his cousin Mun (Tony Leung Ka-Fai). Together, he and Tony run into tough-as-nails gangster Anita Mui, who takes a shine to the two boys. She teaches Chow his gun moves and begins to fall for him, but Chow is oblivious. Meanwhile, Mun gets the idea that Anita fancies him.